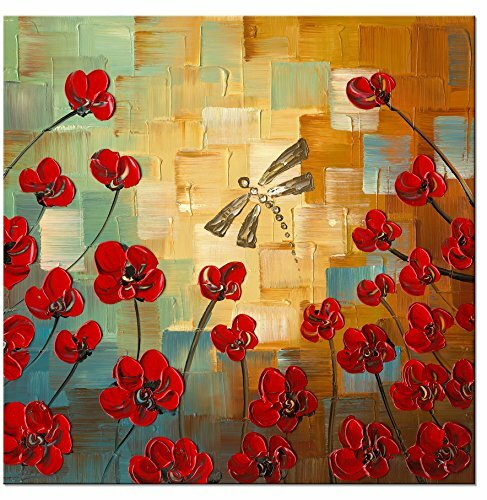 Gallery wrapped red flowers canvas oil paintings wall art set ready to hang for home decorations wall decor, each panel has a black hook already mounted on the wooden bar for easy hanging out of box. Hot Selling oil or Acrylic paintings on canvas, A perfect wall decorations oil paintings for living room, bedroom, kitchen, office, Hotel, dining room, office, bar etc.. Gift card is also available upon request. As each painting is 100% hand-painted, actual paintings may be slightly different from the product image. Due to different brand of monitors, actual wall art colors may be slightly different from the product image.